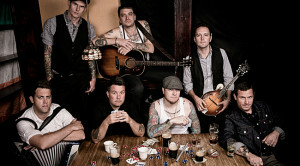 This year, Dropkick Murphys celebrate their 20th anniversary with a tour that kicks off as St. Patrick’s Day events start to take hold. The tour includes performances at many of America’s most historic venues, including Chicago’s Aragon Ballroom, the Civic Theatre in New Orleans, and New York City’s Webster Hall. Singer-drummer Matt Kelly (drums, vocals) answered a few of our questions via email as he talked about the upcoming tour and the Quincy, Massachusetts-based Irish punk band’s latest release, Signed and Sealed in Blood, which debuted in the Top 10 on the Billboard 200. Early on, you played in people’s basements. Talk about those early days. Yeah, we did. In many cities there’s a thriving ‘basement’ scene, especially in places with few all-ages venues. We did basements in Providence, around Boston, Baltimore, and a couple in California. Those days, it was the four band members and our T-shirt guy Brian driving around in an MBTA high-top van and doing small gigs like most bands have done at one time or another. Good camaraderie, long overnight drives, bad food, bad women, and lots of memories. What were some of the most unusual venues like and what was it like to play them? We played the cellar of a squat house in Baltimore in ’97. We drove forever to get there and by the time we showed up the crusty punk bands with whom we shared the bill had packed up and left. Here’s the setting: abandoned/occupied apartment building, people shooting up in the bathrooms, the basement we played had a dirt floor and the “stage” was made out of pallets and carpet. My drums and cymbal stands just wobbled around and sank between the pallet boards. About three songs into our set, Ken broke one of two bass strings I’ve ever seen him break (and he plays a left-handed bass…about as ubiquitous as hens’ teeth). Rick’s amp blew up and all the other band people were gone so we were done. We’d driven 10 or so hours to play three songs! Then there was The Purple Onion in San Francisco, a legendary place that the likes of Bob Dylan and those awful “California sound” bands played in the ’60s. The Onion was run by this awesome lunatic named Tom Guido. He for some reason loved our band. He was a HUGE personality that would introduce the bands like they were someone important like the Beatles or Led Zeppelin. That was definitely a big part of the charm of the place. Did you imagine the group would still be kicking some 20 years after the fact? It was something that happened so quickly that it sort of took us by surprise and I personally hadn’t thought about that. The ten-year mark seemed to take forever, but the last ten years seemed to have happened twice as fast! It was always just “let’s go for it,” and that attitude helped keep the focus, at least for me, in a perpetual state of determination to be as good and intense as we possibly could— or can—and time just shot by. The Mighty Mighty Bosstones gave you your first big break. How did that relationship form? Well, the first guitarist for our group, Rick Barton, was rhythm guitarist in the seminal Boston punk band, the Outlets. Dicky Barrett and Joe Gittleman were and are HUGE Outlets fanatics, having seen them in the early ‘80s when that band was at the top of their game. I think that the Bosstones guys knew that Rick was in this band, and we were kicking up some dust in the Northeast and California, so I think they just asked us on those two points. I mean, this was before the Boys on the Docks EP was even out and months before Do or Die was even recorded— so I think they took a pretty big gamble taking us on the road. Luckily we went down very well in the States and Europe, playing to huge crowds. After those tours, Brian (our T-shirt guy) and I were homeless, so we ended up moving into the apartment that Dicky and Tim had been renting from Joe Gittleman’s mother. The Bosstones guys were always great to us, and I think that first tour taught the guys in our band a lot about the manifold aspects of life on the road. After you put out a series of EPs, Hellcat Records signed the band and released Do or Die, which was produced by Rancid’s Lars Frederiksen. What was the experience of making that album like? It was a special time, to say the least. We did pre-production for Do or Die in Rick’s grandmother’s garage, which was our de facto practice space. Lars had flown out from San Francisco and was crashing on some of the guys’ couches between pre-pro sessions. Half the songs we were going to record were also previously released on other 7-inches and the Boys on the Docks EP, but Lars guided us and gave us a lot of tips on more crafty song arrangement and definitely on sounds. Basically, we tightened the screws on a lot of those songs and changed them for the better. Other songs, specifically “Caught in a Jar,” were in their infancy before I joined but Lars helped us trim the fat and perfect it. Other songs were just riffs or lyrics (or both) that we put together in the practice space up to and during pre-production. It was definitely a fun time and I look back fondly on it. We were really going for it and the camaraderie we shared wouldn’t be matched again till almost ten years later in our existence. When it came time to record the LP, we went to The Outpost in Stoughton, Massachusetts, where the Bosstones had recommended the lovely and talented Jim Siegel as engineer. Also, Rich Spillberg from the legendary Boston metal band, Wargasm, was assistant engineer and all-around one-man comic relief act. It was everybody in the band’s first time doing a full-length LP (except Rick) with an actual recording budget. [There were] no Kickstarter campaigns back then to work with, not that we’d ever be so prideless as to use one. Instead of feverishly watching the clock it was nice to work on instrument sounds and get that killer, killer guitar sound. There was a hell of a lot of thought put into the song order, the guitar sound, layout, the fat guys in hardhats on the front cover, and the final mix. Speaking of which, the record label had the album remixed because they didn’t like how it came out. They somehow got their hands on a “musical life-sucking machine.” The new mix, which the label preferred, was dull, flat, and bereft of life. We were definitely NOT having that. It was a big blow to us because the original mix was exactly how we wanted it. So the long and short of it is, at the end of the day the band won out and the better mix is what you hear. “I’m Shipping Up to Boston,” a song with lyrics penned by Woody Guthrie, has taken on a life of its own. It’s prominently featured in Martin Scorsese’s The Departed and can be commonly heard at sporting events and on television as a theme song for many sports teams. What is it about that song that resonates? I have no idea, because before the songs was featured in the film, it was one of our “also ran” songs. It was second- or third- to last on the album (not a very flattering spot for a “hit” song), and playing it live was like an exercise in statuary . . . nobody moved when we played it. It seriously took that movie to get anybody excited about it, and now it’s a platinum-selling single. I don’t get it! Fine with me though. I guess it’s better than hearing more Beyoncé or modern country or other garbage. “Out of Our Heads” serves as the theme song for TNT’s police drama Boston’s Finest. Talk about how that came about. What was your approach with the album Signed and Sealed in Blood? What were you trying to do differently with the music? Not much different. We still had had a bunch of creative energy and some ideas that weren’t fleshed out enough to be included on the previous album. So we set to songwriting and came up with almost a full album. We headed out on tour and worked on more songs, banged them out in the studio, and recorded them. I think maybe the only difference is that the prior album, Going Out in Style, was a theme album and thus the lyrics all had to tell different facets of the same story. The songs all had to work together. On Signed and Sealed, aside from the actual writing of the lyrics, there wasn’t any need for overanalyzing songs or putting them under a microscope. We just wanted to make a short, concise, catchy Dropkick Murphys album. From the audience response, I believe that’s what we did. What did you want the lyrics to convey? The lyrics are pretty much cut-and-dried and/or loosely metaphorical. You can take them at face value. Nothing too cryptic or bizarre, just songs written by guys who grew up in working families and want to share our experiences and opinions. “Rose Tattoo” is a beautiful ballad. Did something specific inspire it? Talk about your Claddagh Fund, a charity focusing on children’s and veterans’ organizations as well as drug and alcohol recovery programs. What’s it been like to give back in such a significant way? All we are is a conduit for it and our contributions as a band are just a drop in the bucket of the monies raised. Ever since we started it, it’s become abundantly apparent that it’s our fans and supporters who have really made the difference. They’ve raised millions of dollars through the Claddagh Fund for these charities! It makes us proud to be the means by which these people share their generosity. Anybody interested in the Claddagh Fund can visit the website at www.claddaghfund.org. Any idea when the next studio album will come out and what the songs might sound like? We’re going to be recording some songs in April and May, so be on the lookout for an album by early next year. The songs are going to sound like Dropkick Murphys songs!